"Unrealistic shark game inbound! At least from a science prespective…." Today, Ubisoft announced that Hungry Shark World, from the acclaimed Hungry Shark® mobile franchise, will launch on PlayStation®4 computer entertainment system, the Xbox One family of devices including the Xbox One X and Nintendo Switch on July 17th. 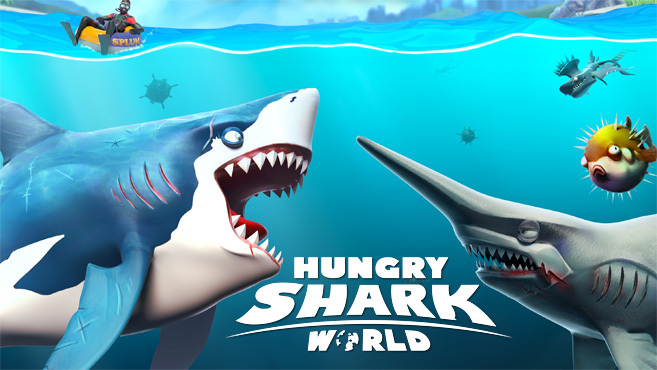 Developed by Future Games of London, a Ubisoft Studio, Hungry Shark World will let players rise through the ranks of the food chain, starting as a small shark with a little bite and progressing into the meanest predator in the ocean. In this awesome arcade adventure, players will eat as much as they can to take on a variety of fearsome bosses, including gruesome goblin sharks, prehistoric predators and giant squids.